As an expression of love, tweets are for the birds. 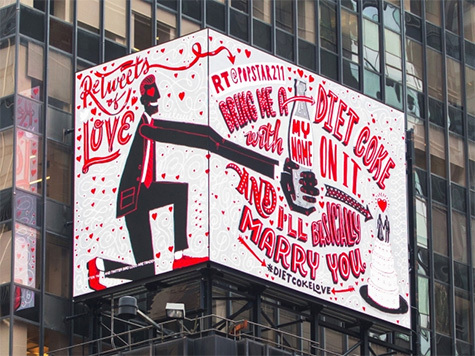 But Diet Coke plans to transform the tweets of lovebirds into public displays of affection with its new “Retweets of Love” ad campaign. The beverage brand will turn the tweets of love into an array of artistic ads on billboards, artwork, jewelry, magazine pages, and more. Each retweet will be customized to capture the heart of its message. Adweek.com shared the love behind the caring campaign. 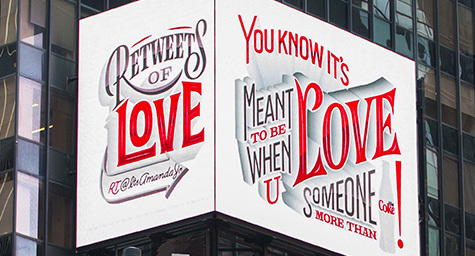 The “Retweets of Love” campaign was created by New York ad agency Droga5, with the help of renowned designers and illustrators including Erik Marinovich, Marta Cerdà Alimbau, and Jeff Rogers. The campaign is an extension of the brand’s “Get a Taste” campaign launched last fall. 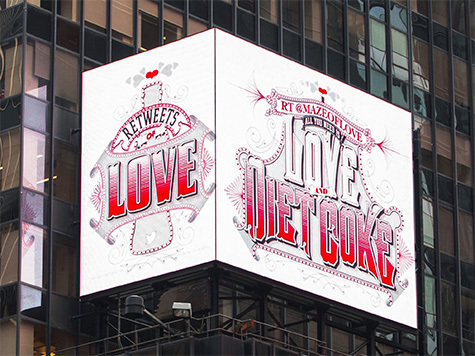 The digital displays of devotion are scheduled to run throughout the fall, beginning this week in Times Square in New York City with three tweets from Diet Coke lovers in Texas, Virginia, and Oregon. Discover why there’s a lot to love in social media. Contact MDG Advertising today at 561-338-7797 or visit mdgadvertising.com.